Kevin and Sarah Campbell with Zach and Cole. When you ask Kevin (’00) and Sarah (Leesman ’01) Campbell who their heroes are, they will tell you: the birth mothers of their two sons. “They gave us one of the greatest gifts we could ever receive on this earth, and we are truly thankful they entrusted us with their sons,” Kevin writes. We continue our series about Abilene Christian University alumni who have followed their hearts to adopt, with the Campbells’ story of pursuing open adoptions through Christian Homes and Family Services of Abilene. Kevin is chief enrollment officer for ACU, and Sarah is director of student ministries at Highland Church of Christ. For Sarah and I, adoption was not a question of if, but when. We had talked about adoption since the days we were dating, and without going into too much detail, Sarah had a medical history and a number of surgeries that meant the likelihood of pregnancy for us was slim to none. As we made our decision for how we wanted to adopt, we came across three fundamental questions we had to answer. Did we want our adoption to be domestic or international? What method did we want to pursue with our adoption? There is fostering to adopt, private adoption, and adoption via agency. There is not a right way or a wrong way to adopt; it is where a family is called to pursue. We chose to go down the path of domestic, open adoption via Christian Homes and Family Services because we wanted our children to know their birth mothers, and we wanted to ensure the birth mothers received as much care and support as possible. We cherished the way Christian Homes loved and cared for birth mothers, providing mentors and counseling during the pregnancy and after the birth. We have adopted two boys, Zach, 4, and Cole, 1, from Christian Homes and were able to bring both boys home from the hospital on their third day of life. They have blessed our lives, and we are grateful they call us mom and dad. But there are two other very significant people in this story, and I would like to shine the spotlight on them: the birth mothers. Our boys’ birth mothers are two of our biggest heroes! One was a teenager and the other was in her 30s. They each felt they could not provide the home they desired for their child at the time of their pregnancy, and they wanted their boys to be raised in a Christian home. As we pulled away from the hospital to bring the boys to our home, we were overwhelmed with joy and grief at the same time. Joy as our family grew, and grief as we realized the magnitude of the sacrifice the birth mothers made on our behalf. They gave us one of the greatest gifts we could ever receive on this earth, and we are truly thankful they entrusted us with their sons. We have enjoyed seeing our boys interact with their birth mothers and their birth mothers’ extended families, who will know and love our boys throughout the years. We have pictures of the birth mothers in each boy’s room, and we regularly pray for them as a family. We thank God for the decision of love and sacrifice they made in choosing life for our boys and choosing us to be their parents. Adoption has been a front row seat to witnessing God’s redeeming love in our lives, the lives of our sons and in the lives of their birth mothers. We have been blessed beyond measure to see how God makes beautiful things out of every situation. In the weeks to come, we will introduce you to other alumni who help make a real difference in the world – and enrich their own families – by adopting and fostering children. 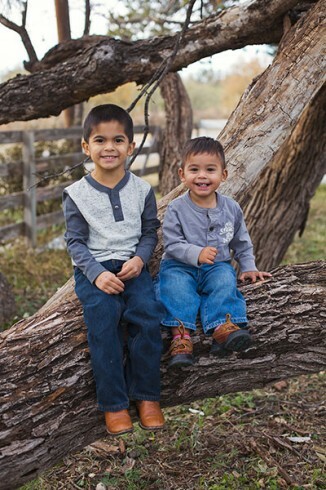 If you have an adoption story or photos you would like to share with us, please email Robin Saylor, robin.saylor@acu.edu.